I’m a mega declutterer, but I didn’t start out that way. I started out life as a hoarder, copying my mum. It meant keeping every letter, every card, and filling my room with little ornaments and bits and bobs. There was a huge fear of loss, and having to keep EVERYTHING just in case. Mum was that superstitious that the last two cigarettes in her packet where always lit together and had to go in the same ash tray. But just after my Dad died (I was 20), Mum changed the locks, and I was left without my ‘stuff’ for 6yrs. It’s a long story as to why she did it, but lets just say that death often brings the worst out in people, and since becoming a Mum myself, I kind of understand how being a Mum messed with an already messed up head. So after 6yrs of going cold turkey, I started to break a habit of a life time, and now many years on, I’m incredibly grateful for the present she gave me, even if she didn’t know what she was doing. But even though I’m pretty good at it, I did spend last year doing a really big time clear out ready for Little Dimples, and I suspect that 2011 will have even more. 2010 was about the ‘stuff’ we had collected as a couple over the past 21 years or that couldn’t be used by baby, and this year is breaking things down even more to the small nooks and crannies that still have bits to be sorted in them. A lovely friend of mine wrote a blog the other day, which sounded like she was a bit overwhelmed with where to start, so I thought I would share some tips. I might not be a professional declutterer, but I’m pretty darn good at it! When I worked in technical support for a big database company we used the Pareto’s 80/20 rule to get through our list of calls. It goes like this: 80% of the calls take about 20% of the time to fix. The remaining 20% of the calls will take 80% of the time. So when starting out and wanting to clear the decks, go for the 80% which can be done quickly and gives the quickest results in terms of reducing the load. Pick 1 room. Get it sorted. It’s only when you have a bit of space that you can tackle the remaining 20%. We are girls (oops, is that a bit obvious! ), and hence subject to the cycles of hormones. Use them! Some times of the month you will have the energy and urge to have a mega clearout. During those times, stop everything else and use the energy. Don’t ever do it when it feels like a drudge to do it, that’s not the point. 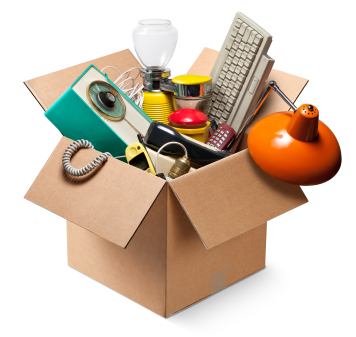 If you are doing your first major clear out, then someone who sells stuff for you on ebay would be a good place to start (I have someone if you are anywhere near St Albans). So from an 80/20 perspective, the first task would be to go round your house and make a big collection of anything not needed that might have some value, or might have some value when packaged with other things. Charity shops are of course also great, but I have found them to not always appreciate a big load of stuff. There is one near me in Radlett which is always happy to take things, and they will take old clothes to go to recycling too, as they get money for them. But Freecycle (mine is a yahoo group for st albans called freegle) is fantastic, as you can get rid of just about anything, including electricals and stuff that wont go to charity. Don’t say ‘yes’ immediately. Wait until a few people say they want the object and then ask for dates and times of collection. Create a memory box for keeping trinkets in. I had 2 huge IKEA boxes, and was branching into a 3rd, which I have decided is a little much for just 40yrs as I plan on another 60yrs. So I’m just going through my two, to cut them into one, and then have another for the kiddies. If it is too big, create a memory photo album. This is especially good for children’s art stuff. Yes you can keep it all. But for goodness sake keep it digitally, and just keep the stuff with the best memories in the box! Oooh, but keep a backup of your computer and photo’s and put them in a fire safe. Christmas Decorations, holiday stuff like snowboards, and other things that you use once per year. NOT for storing stuff ‘just in case’. Imagine that loft is your head. I’m not a big Feng shui person, but for the past few years I have been able to ‘feel’ that loft sitting above us with a pile of crap in it. The worst thing is that if it is choccer to the top, then you’ll never find what you want when you are looking for it, or remember. Of course there are a few things that are worth keeping just in case. I do have an old wooden ark that my kids play with, plus a huge teddy that I have a photo of me with, and a couple of little toys. So they are good memory things. But the other things you will probably get back if you join a yahoo freegle/freecyle group if there is another instance where you will need it. There is a little secret I have for you. I can’t explain it all in a blog. But it is ‘Nothing is Missing’. Nothing ever disappears completely. Look at water. It can turn into ice or steam. But it doesn’t go away. With some help I could show you that as things or people left your life, one or many things appeared that together could do the same job. If you ever get yourself into a big panic about losing something, I can definitely sort it out for you, so don’t worry. You are probably tired, after all you are a Mum. So don’t kill yourself doing this. Make a list, which is really detailed so that you can tick lots of things for a little effort, and just start doing it bit by bit. It doesn’t matter if it takes a year. In fact, this is a constant job anyway, because if you end up loving it like me, you will be decluttering for the rest of your life. Plus, the most important part of the decluttering is the emotional and mental effects. So remember to leave some space for you to declutter your brain noise (fear, guilt and worry), your body (detox, exercise, and pamper) and your life (work/life balance and relationships). Let me know how you do. Now I’m off to finish those Ikea boxes of mine! Oooh and a quick p.s. to another Mummy blogger friend of mine. No it is not possible to have a totally tidy house (you are like me, so the kind of perfectly tidy), plus work half/full time, plus do everything else; so stop feeling guilty about those people having a go about you having toys everywhere. If you ever come round and my house looks tidier, it’s just because I work less days, and have probably cut back on work a little for a week or so to get it back into order (like at the moment). Or you happened to just turn up when I was at the right point in my cycle!